Derry City's Airtricity League Premier Division meeting with St Patrick's Athletic on Friday, March 30th will be the first televised game from the new Brandywell stadium it has been announced. Broadcasters RTE & eirSport released details of their March and April schedules with six SSE Airtricity League Premier Division matches selected for live TV coverage until the end of April. RTE are set to show four games live starting with Waterford v Shamrock Rovers on Friday, March 23, with the kick-off time now changed to 7:45pm. A week later, RTE head to Brandywell Stadium for the first time to beam the impressive new stadium into houses all over the country as Kenny Shiels men welcome the Dubliners for a match that kicks off at the slightly earlier time of 7.30pm. 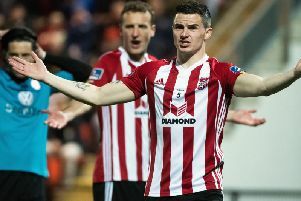 The Candy Stripes made an impressive debut in the redeveloped ground on Monday night, hitting five past a shell shocked Limerick, form they will be hoping to carry into Friday's second match at the Stadium against Bray Wanderers. Other matches selected see Shamrock Rovers' visit to Dundalk on Friday, April 6 (7.30pm) on RTE, Rovers entertaining Bohemians on Friday, April 13 on eirSport (8pm) and Cork's visit to Bohemians on Friday, April 20 (8pm), also on eirSport. The final game to be broadcast in April will be Cork City v Dundalk, with kick-off at 7.15pm, live on RTE as the title rivals go head-to-head at Turner's Cross on Friday, April 27.